The Manufacturing Scorecard is how we help our clients monitor productivity and efficiency. 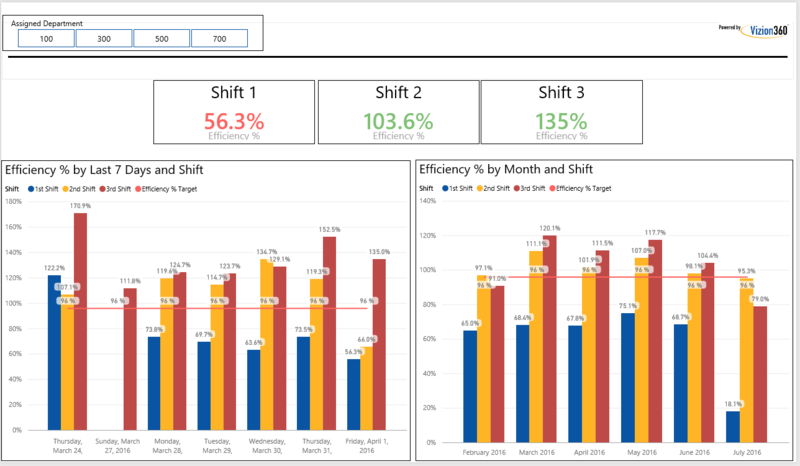 This gives an Operations Manager a high-level look at performance the previous day by shift and where things are tracking for the month and year. We start by asking “what are the 5 things you want to know at the start of each day”, and customize the solution from there. At Vizion Solutions, our goal is to connect information to decision makers and ultimately help them make sense of their data. Our Vizion360 Impact Analytics Manufacturing Scorecard is one way we help our clients monitor the pulse of their business. This design is for an individual or individuals responsible for organizational productivity and efficiency and gives the Operations Manager a high level look at what happened on the shop floor the previous day by shift, by work center and by department. In addition, we deliver week-to-date and year-to-date metrics to give a 360-degree view of the business and where things are tracking. As part of Vizion Solution’s proven process and to deliver the Operations executive the KPI’s and metrics they need to run their business, we start by asking them “what are the 5 things you want to know at the start of each day?” “What are the 5 things you want to know at the beginning or end of each week?” “Month?” “Quarter?” This allows us to get to know the client and help them determine or perhaps discover what he or she really needs and wants from our Vizion360 Impact Analytics BI solution. With those answers, we can customize the dashboard and reports based on the individual. The result is that our Vizion360 Impact Analytics Manufacturing Scorecard approach provides the Operations Manager with all the answers to their business questions as soon as they power up their computer every morning in just a few clicks. Why Choose Vizion Solutions and Vizion360 Impact Analytics? Vizion Solutions has extensive experience implementing BI solutions. We integrate BI strategies, leveraging our expertise to customize a data solution that helps you maximize efficiency and profitability. 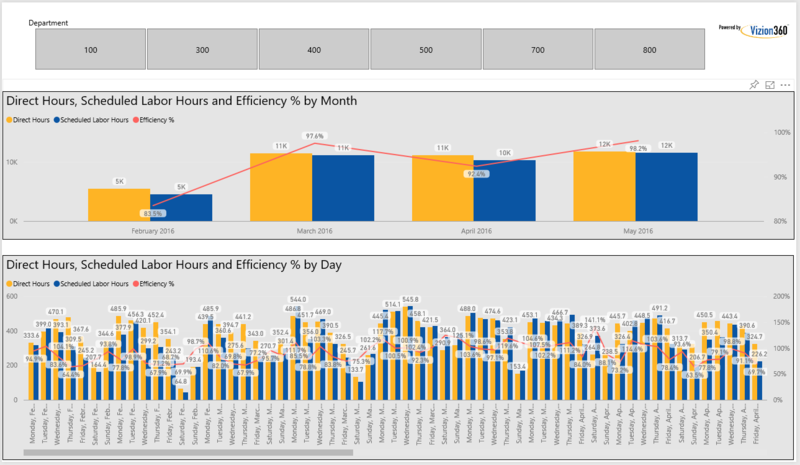 Using our Vizion360 Impact Analytics and Power BI, our team of BI Analysts and Success Managers work with your organization's decision-makers and project teams to identify, recommend, design, develop, implement, and support cost-effective solutions for external and internal development projects. Vizion Solutions believes that you should maximize the allocation of your resources towards your core competencies. 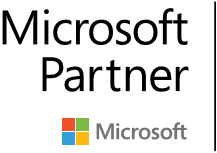 We partner with you and allow you to leverage our experience. Our platform makes managing your data and information easier and faster. 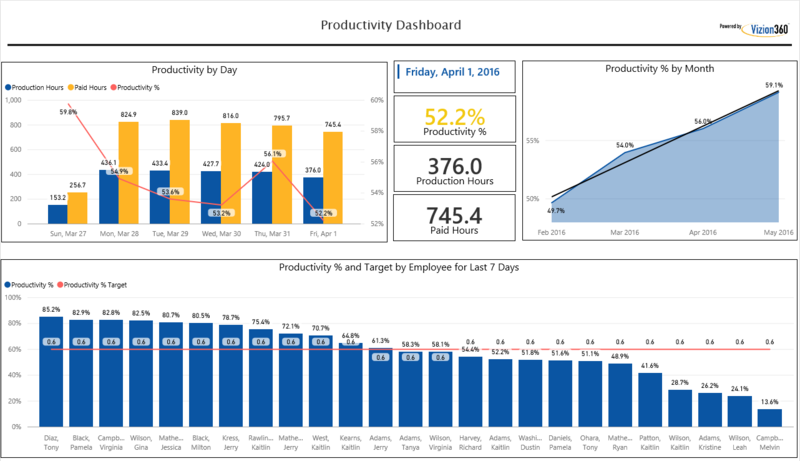 We design the BI solution around you, the business user, highlighted by point and click access to reports, effective data visualizations/interactive dashboards via Power BI and drag-and-drop ad hoc analytics - NO queries, NO code! Vizion Solutions is not just a vendor, we are your full-service BI solutions partner, assisting through all stages of the BI process from exploration to development, deployment, training, ongoing support and ultimately your continued success.